ScienceDaily (July 10, 2010) — Whether mom's golden child or her black sheep, siblings who sense that their mother consistently favors or rejects one child over others are more likely to show depressive symptoms as middle-aged adults, finds a new study by Cornell gerontologist Karl Pillemer. Prior research has shown that parental favoritism among siblings negatively affects mental health and often triggers behavioral problems in children, teens and young adults, but the survey of 275 Boston-area families, co-directed by Purdue sociologist Jill Suitor, is the first to show that such harmful effects persist long into adulthood. "Perceived favoritism from one's mother still matters to a child's psychological well-being, even if they have been living for years outside the parental home and have started families of their own," said Pillemer, the Hazel E. Reed Professor in the Department of Human Development and associate dean for extension and outreach in the College of Human Ecology, about his paper in the Journal of Marriage and Family (April 2010). "It doesn't matter whether you are the chosen child or not, the perception of unequal treatment has damaging effects for all siblings," he added. "The less favored kids may have ill will toward their mother or preferred sibling, and being the favored child brings resentment from one's siblings and the added weight of greater parental expectations." Favoritism may be difficult for mothers to avoid, however, as the researchers found that 70 percent of moms surveyed named a child to whom they felt closest and only 15 percent of children saw equal treatment by their mothers. Similarly, 92 percent of children and 73 percent of mothers specified a child with whom the mother battled most frequently. The study, which controlled for family size, race and other factors, drew on interviews with 275 mothers in their 60s and 70s with at least two living adult children and also surveys of 671 offspring of the women. In addition to questions about emotional closeness or excessive conflict with a particular child, mothers and children were asked about the mother's expectations for who will care for her when she becomes ill or disabled. When mothers designated a child as her caregiver, all children suffered greater depressive symptoms, though the children's perceptions of their mother's preference did not relate to their mental health. The findings could lead to new therapies for practitioners who work with later-life families, Pillemer said. "We have a powerful norm in our society that parents should treat kids equally, so favoritism can be something of a taboo topic. If counselors can help older parents and adult children bring some of these issues into the open, it may help prevent family conflict from arising." In addition to Suitor, other co-authors include Charles Henderson, senior research associate in human development, and Ph.D. student Seth Pardo, both of Cornell. A new compound similar to the active component of marijuana (cannabis) might provide effective pain relief without the mental and physical side effects of cannabis, according to a study in the July issue of Anesthesia & Analgesia, official journal of the International Anesthesia Research Society (IARS). The synthetic cannabinoid (cannabis-related) compound, called MDA19, seems to avoid side effects by acting mainly on one specific subtype of the cannabinoid receptor. "MDA19 has the potential for alleviating neuropathic pain without producing adverse effects in the central nervous system," according to the study by Dr Mohamed Naguib of The University of Texas M.D. Anderson Cancer Center. The researchers performed a series of experiments to analyze the pharmacology and effects of the synthetic cannabinoid MDA19. There are two subtypes of the cannabinoid chemical receptor: CB1, found mainly in the brain; and CB2, found mainly in the peripheral immune system. Dr. Naguib's group has been doing research to see if the cannabinoid receptors -- particularly CB2 -- can be a useful target for new drugs to treat neuropathic pain. Neuropathic pain is a difficult-to-treat type of pain caused by nerve damage, common in patients with trauma, diabetes, and other conditions. MDA19 was designed to have a much stronger effect on the CB2 receptor than on the CB1 receptor. In humans, MDA19 showed four times greater activity on the CB2 receptor than on the CB1 receptor. In rats, the difference was even greater. The experiments also showed that MDA19 had "protean" effects, so-called after the shape-shifting Greek sea god Proteus -- under different conditions, it could either block or activate the cannabinoid receptors. In rats, treatment with MDA19 effectively reduced specific types of neuropathic pain, with greater effects at higher doses. At the same time, it did not seem to cause any of the behavioral effects associated with marijuana. Potential to Develop Effective Pain Drugs that Avoid Side Effects The "functional selectivity" of MDA19 -- the fact that it acts mainly on the CB2 receptor and has a range of effects under differing conditions -- could have important implications for drug development. "[W]ith functionally selective drugs, it would be possible to separate the desired from the undesired effects of a single molecule through a single receptor," Dr. Naguib and colleagues write. This means that MDA19 could be a promising step toward developing medications that have the pain-reducing effect of cannabinoids while avoiding the mental and physical side effects of marijuana itself. However, more research will be needed before MDA19 or other agents that act on the CB2 receptor are ready for testing in humans. "These elegant studies by Professor Naguib demonstrate remarkable analgesic properties for this synthetic cannabinoid," comments Dr. Steven L. Shafer of Columbia University, Editor-in-Chief of Anesthesia &Analgesia. "The studies suggest a novel mechanism for this protean agonist. Although preliminary, these studies suggest that synthetic cannabinoids may be significant step forward for patients suffering from neuropathic pain." The muscle that lets your eye blink is the fastest muscle in your body. It allows you to blink 5 times a second. On average, you blink 15 000 times a day. That’s about 10 times per minute, or more than five million times a year. Women blink more than men. Jean-Dominique Bauby, a French journalist suffering from “locked-in” syndrome, wrote the book “The Driving Bell and the Butterfly” by blinking his left eyelid – the only part of his body that could move. Animals blink too, of course. Some bird species, usually flightless birds, have only a lower eyelid, whereas pigeons use upper and lower lids to blink. Fish and insects do not have eyelids – their eyes are protected by a hardened lens. To care for your eyes, eat carrots. They really do make you see better. Vitamin A is known to prevent “night blindness,” and carrots are loaded with Vitamin A. Deficiency of Vitamin A actually is a significant world problem, comparable to that of protein deficiency and second only to caloric deficiency. Carrots also contain fiber, potassium, vitamin C, and beta-carotene, which may reduce the risk of heart disease and cancer. Carrots have zero fat content. One carrot provides more than 200% of recommended daily intake of Vitamin A. Carrots were first cultivated in 500 BC in the Mediterranean regions. The first carrots were purple, white, and yellow. They were introduced in Europe in the 1600s. Orange carrots – the ones we know today – were first grown in Japan in the 17th century, and later made popular by the Dutch. Sorry I cant paste the whole blog but here is the link. You live your life at 2.4GHz. Your router, your cordless phone, your Bluetooth earpiece, your baby monitor and your garage opener all love and live on this radio frequency, and no others. Why? The answer is in your kitchen. Before we charge too far ahead here, let's run over the basics. Your house or apartment, or the coffee shop you're sitting in now, is saturated with radio waves. Inconceivable numbers of them, in fact, vibrating forth from radio stations, TV stations, cellular towers, and the universe itself, into the space you inhabit. You're being bombarded, constantly, with electromagnetic waves of all kind of frequencies, many of which have been encoded with specific information, whether it be a voice, a tone, or digital data. Hell, maybe even these very words. On top of that, you're surrounded by waves of your own creation. Inside your home are a dozen tiny little radio stations: your router, your cordless phone, your garage door opener. Anything you own that's wireless, more or less. Friggin' radio waves: they're everywhere. What that number actually signifies is broadcast frequency, or the frequency of the waves that the phone's base station sends to its handset. That's it. In fact, the hertz itself just a unit for frequency in any context: it's the number of times that something happens over the course of a second. In wireless communications, it refers to wave oscillation. In computers, it refers to processor clock rates. For TVs, the rate at which the screen refreshes; for me, clapping in front of my computer right now, it's the rate at which I'm doing so. One hertz, slow clap. The question, then, is why so many of your gadgets operate at 2.4GHz, instead of the ~2,399,999,999 whole number frequencies below it, or any number above it. It seems almost controlled, or guided. It seems, maybe, a bit arbitrary. It seems, well, regulated. A glance at FCC regulations confirms any suspicions. A band of frequencies clustered around 2.4GHz has been designated, along with a handful of others, as the Industrial, Scientific, and Medical radio bands. "A lot of the unlicensed stuff—for example Wi-Fi—is on the 2.4GHz or the 900Mhz frequencies—the ISM bands. You don't need a license to operate on them." That's Ira Kelpz, Deputy Chief, Office of Engineering and Technology at the Federal Communications Commission, explaining precisely why these ISM bands are attractive to gadget makers: They're free to use. If routers and cordless phones and whatever else are relegated to a small band 2.4GHz, then their radio waves won't interfere with, say, cellphones operating at 1.9GHz, or AM radio, which broadcasts between 535 kHz and 1.7 MHz. The ISM is, in effect, a ghetto for unlicensed wireless transmission, recommended first by a quiet little agency in a Swiss office of the UN, called the ITU, then formalized, modified and codified for practical use by the governments of the world, including, of course, our own FCC. The current ISM standards were established in 1985, and just in time. Our phones were one the cusp of losing their cords, and in the near future, broadband internet connections would come into existence and become magically wireless. All these gadgets needed frequencies that didn't require licenses, but which were nestled between the ones that did. Frequencies that weren't so high that they sacrificed broadcast penetration (through walls, for example), but weren't so low that they required foot-long antennae. In short, they needed the ISM bands. So they took them. Now, there are many, many frequencies that qualify as "unlicensed," but only a handful get used in our phones, routers, and walkie talkies. In the case of something like phones, which are sold paired with a specific base station, choosing the right unlicensed frequency is a pretty straightforward calculation: A 900MHz system will be more easily able to broadcast through a multi-floor house, but a 2.4 GHz system will generally require a smaller antenna, which keeps the phone's size down. Wi-Fi routers started as proprietary, paired systems operating on all manner of frequencies, only settling on a standard—5GHz—with the codification of 802.11a. Then the Institute of Electrical and Electronics Engineers agreed that 2.4GHz, with its wide channel selection and range/penetration/cost potential, was a safer bet. Today, some Wireless N routers can operate on both 2.4GHz and 5GHz bands concurrently. Routers could function just as well at 2.3 or 2.5GHz, but they're not allowed. It's the rules. The 2.4GHz band, which runs from about 2400 to 2483.5Mhz, is where routers have to live. For this, they can thank the microwave. Microwave ovens heat food by blasting it with, literally, microwaves. (It bears mentioning that in terms of electromagnetic waves, microwaves, the wavelengths of which range from a millimeter all the way up to a meter, aren't particularly "micro".) At certain frequencies, such waves cause something call Dielectric Heating in water and fat, while passing straight through other materials, like plastic or glass, without exciting them much at all. (Metal, on the other hand, gets too excited.) For a full explanation of how dielectric heating works, click here, but for the purposes of this article, just know this: Only certain materials are susceptible, and particularly when bombarded with waves of a certain frequency and power. One of the commonly used frequencies is 915MHz. Others fall at 5.8 GHz and 24GHz, though creating microwave ovens using the latter would be quite expensive. But a frequency that proved to be both effective and relatively cheap to achieve was 2.45GHz. That's the frequency emitted by your microwave, right there in the kitchen. So, when the FCC got around to establishing just which frequencies unlicensed gadgets could broadcast on, they had a lot of things to think about. First, they had to consider which frequencies were already in use by stuff like radio and TV. Those would be off-limits. Then, of the remaining, usable, unallocated frequencies, they sought out the ones that were already being used by existing equipment. One thing they noticed? Microwaves were popular! They'd been around commercially since 1947. And generally, they operated at a specific frequency: 2.45GHz. Despite heavy shielding, microwave ovens' powerful emissions could sometimes interfere with neighboring frequencies, so it was decided that they should be given a few megahertz of space in both directions. And so the 2400 to 2483.5Mhz ISM band was born. That these free-for-all frequencies could one day get overcrowded was always a possibility. But the FCC's primary concern is minding the frequencies it licenses; everyone working in ISM frequencies, then, must fend for themselves. And they do! Your microwave and your router might emit waves in the same frequency range, and this might screw with your router's connectivity a little bit. Generally, though, the router companies have been able to minimize interference by boosting signal strength and writing more intelligent firmware. And outward emissions of microwaves are at least supposed to be minimized. (That perforated metal shield in the glass door of your microwave? It's a shield—the holes in it are smaller than the physical width of the 2.4GHz wave.) In the end, things work. That's not to say that the 2.4GHz band isn't getting crowded. Many routers operate at least in part on the 5GHz band, and a quick survey of your local Best Buy will find wireless phones at 900MHz, 1.9GHz and 5GHz. But the King of Frequency mountain, the band loved by billions of wireless connections around the world, be they Bluetooth, Wi-Fi, or nonstandard RF remotes, is my band, your band, our band, 2.4. And all because we wanted to cook our food a little faster. Updated for clarification: Microwave ovens could conceivably work across the electromagnetic spectrum, and there aren't any sharp resonances at any particular point; other industrial and regulatory pressures helped drive the standard frequency to 2.45GHz, as well as the aforementioned engineering conveniences. Further, some commenters are claiming that 2.4GHz is the "resonant frequency" of water as an alternative explanation. This is a common misconception.—Thanks, Jake! Still something you wanna know? Send questions about That Thing That Doesn't Make Sense here, with "Giz Explains" in the subject line. A brief history of islam and its several aspects. This is a must read book. I'll start with the most recent. A: Regulation to provide for Nifaz-e-Nizam-e-Shariat through Courts in the Provincially Administered Tribal Areas of the North-West Frontier Province, except the Tribal Area adjoining Manshera district and the former State of Amb. Explanation.-In the application of this clause to the personal law of any Muslim sect, the expression Quran Majeed and Sunnah-e-Nabvi (Sallallaho alaihe wasallam) shall mean the Quran Majeed and Sunnah-e-Nabvi (Sallallaho alaihe wasallam) as interpreted by that sect. (2) All other expressions, not expressly defined in this Regulation, shall have the same meanings as assigned to them in any other law for the time being in force, in the said area to which this Regulation applies. (2) In relation to proceeding with and conducting the criminal or civil cases, all powers, functions and duties concerned, assigned or imposed on Judicial Officer in the North-West Frontier Province under any law for the time being in force, shall, subject to application of such law in the said area and established principles of Sharia'h, be exercised, performed or discharged by them as designed in column 3 of Schedule-II. (3) Subject to the general superintendence of the principal seat of Dar-ul-Qaza, a Zilla Qazi shall supervise the work of subordinate courts, and, through the District Police Officer concerned, the process serving staff, within the local limits of his jurisdiction. (1) In each district or protected area, there shall be a District Magistrate, Additional District Magistrates, Sub-Divisional Magistrates and other Executive Magistrates, as the Government deems necessary. For this purpose he can take action against an individual, under the established principles of Shariah. Explanation.-The phrase "Sadd-e-Zarr-e-Jinayat"( ) means and includes all actions and steps taken under the Sharia'h laws and any other law enforced for the time being for the control of crimes. (2) No Court shall entertain a suit unless the plaintiff/complainant verifies that copies of plaint alongwith supporting documents have been sent, through registered post with acknowledgment due to all the defendants, except in case of a suit for perpetual injunction accompanied by an application for temporary injunction. (4) If the Zilla Qazi or, as the case may be, the presiding officer of the principal seat of the Dar-ul-Qaza, in relation to proceedings in the Court of Qazi, upon examination of causes of delay, is of the opinion that the delay has been caused due to the delaying tactics of a party, it shall fix a penalty or cost to be recovered from the defaulting party and direct the court concerned to dispose of the case within an extended period of not more than one month. (5) If the District Magistrate, in relation to proceedings in the Court of Executive Magistrate, upon examination of causes of delay, is of the opinion that the delay has been caused due to the delaying tactics of a party, it shall fix a penalty or cost to be recovered from the defaulting party and direct the court concerned to dispose of the case within an extended period of not more than one month. (ii) in the case of Executive Magistrate, inform the District Magistrate about such delay and recommend for disciplinary action, provided in clause (i) of sub-paragraph (6) of paragraph 9.The District Magistrate shall act on the recommendations accordingly. Provided that such court shall have the power to rectify any illegality or irregularity of omission which, in the opinion of he said court, may result injustice to any of the parties. (1) Soon after the commencement of this Regulation, Government shall take necessary steps to establish as many courts to ensure expeditious dispensation of justice within prescribed time schedule. (2) Where the number of pending cases at a time exceeds more than one hundred and fifty in a court of Zilla Qazi, District Magistrate, or, as the case may be, Izafi Zilla Qazi, or exceeds more than two hundred cases in a court of Aa'la Ilaqa Qazi, Executive Magistrate, or, as the case may be, Ilaqa Qazi, it shall be necessary for Government to establish a new court and provide it all related facilities to ensure dispensation of justice within prescribed time schedule. Subject to the Constitution of the Islamic Republic of Pakistan, appeal/revision against the Orders/Judgments/Decree of the Dar-ul-Qaza shall lie to the Dar-ul-Dar-ul Qaza, for the purpose of this Regulation. Provided that, in no circumstances, a case shall remain with a musleh or, as the case may be, musleheen for a period of more than fifteen days, but the court may, in extraordinary circumstances, for reasons to be recorded in writing, extend the time for fifteen days and, on the expiry of the aforesaid period, it shall stand withdrawn to the court for further proceedings. (6) The court shall, before proceeding further, provide an opportunity to the parties to submit objections, if any, to such report, and, if any, objections are so made, the court shall, after hearing the parties, decide about the correctness or otherwise of the objections. (7) The court shall, keeping in view the actual expenses incurred by the musleh or musleheen, on traveling to, an stay at, the place other than the place of his or, as the case may be, their residence, and the time spent in dealing with the case, in particular circumstances of each case, fix the remuneration of such musleh or musleheen, to be paid by each party in such proportion as may be determined by the court. All executive authorities in the said area, including members of law enforcing agencies and members of other services of Pakistan, shall act in aid and assistance of the Courts, and shall implement their judicial orders and decisions. Government may, where necessary, issue such directions to any law enforcing agency as are necessary in relation to the service of Courts Processes on the parties, witnesses or any other person, and, for any general or specific purposes, in order to ensure the conduct of such law enforcing agency in aid and assistance of the Courts. All the processes and proceedings of the court, including the pleadings, evidence, arguments, orders and judgments shall be recorded and conducted in Urdu, Pushto or in English and the record of the Court shall also be maintained in the said language. Government may, make rules for carrying out the purposes of this Regulation. The provisions of this Regulation shall have overriding effect notwithstanding anything to the contrary contained in any other law for the time in force in the said area. (e) affect any investigation, legal proceeding or remedy in respect of any such right, privilege, obligation, liability, penalty, forfeiture or punishment; and any such investigation, legal proceeding or remedy may be instituted, continued or enforced, and any such penalty, forfeiture or punishment may be imposed, as if the law, instrument, custom or usage had not been repealed or ceased to have effect, as the case may be. 16: Minister for Environment Wajid Ali Khan, Dr Shamsher Ali Khan, DIG of Malakand, and DPO of Swat from the government’s side and Muhammad Amin, Ali Bakht, Muslim Khan, Mehmood Khan and Nisar Khan from Taliban side are members of the committee to oversee implementation of the agreement. The eastern and southern frontier of his Highness’s dominions, from Wakhan to the Persian border, shall follow the line shown in the map attached to this agreement. The Government of India will at no time exercise interference in the territories lying beyond this line on the side of Afghanistan, and His Highness the Amir will at no time exercise interference in the territories lying beyond this line on the side of India. The British Government thus agrees to His Highness the Amir retaining Asmar and the valley above it, as far as Chanak. His Highness agrees, on the other hand, that he will at no time exercise interference in Swat, Bajaur, or Chitral, including the Arnawai or Bashgal valley. The British Government also agrees to leave to His Highness the Birmal tract as shown in the detailed map already given to his Highness, who relinquishes his claim to the rest of the Waziri country and Dawar. His Highness also relinquishes his claim to Chageh. The frontier line will hereafter be laid down in detail and demarcated, wherever this may be practicable and desirable, by joint British and Afghan commissioners, whose object will be to arrive by mutual understanding at a boundary which shall adhere with the greatest possible exactness to the line shown in the map attached to this agreement, having due regard to the existing local rights of villages adjoining the frontier. From the crest of the Khwaja Amran range near the Psha Kotal, which remains in British territory, the line will run in such a direction as to leave Murgha Chaman and the Sharobo spring to Afghanistan, and to pass half-way between the New Chaman Fort and the Afghan outpost known locally as Lashkar Dand. The line will then pass half-way between the railway station and the hill known as the Mian Baldak, and, turning south-wards, will rejoin the Khwaja Amran range, leaving the Gwasha Post in British territory, and the road to Shorawak to the west and south of Gwasha in Afghanistan. The British Government will not exercise any interference within half a mile of the road. The above articles of' agreement are regarded by the Government of India and His Highness the Amir of Afghanistan as a full and satisfactory settlement of all the principal differences of opinion which have arisen between them in regard to the frontier; and both the Government of India and His Highness the Amir undertake that any differences of detail, such as those which will have to be considered hereafter by the officers appointed to demarcate the boundary line, shall be settled in a friendly spirit, so as to remove for the future as far as possible all causes of doubt and misunderstanding between the two Governments. Being fully satisfied of His Highness’s goodwill to the British Government, and wishing to see Afghanistan independent and strong, the Government of India will raise no objection to the purchase and import by His Highness of munitions of war, and they will themselves grant him some help in this respect. Further, in order to mark their sense of the friendly spirit in which His Highness the Amir has entered into these negotiations, the Government of India undertake to increase by the sum of six lakhs of rupees a year the subsidy of twelve lakhs now granted to His Highness. © Administrative mechanism will be instituted for the prevention of misconduct, implementation of code of ethics, and removal of judges on such charges brought to its attention by any citizen through the proposed commission for appointment of Judges. (d) All special courts including anti-terrorism and accountability courts shall be abolished and such cases be tried in ordinary courts. Further to create a set of rules and procedures whereby, the arbitrary powers of the chief justices over the assignment of cases to various judges and the transfer of judges to various benches such powers shall be exercised by the Chief Justice and two senior most judges sitting together. © Accountability of NAB and other Ehtesab operators to identify and hold accountable abuse of office by NAB operators through purgery and perversion of justice and violation of human rights since its establishment. On August 22, 2002, the President of Pakistan, Gen. Pervez Mir Mir Musharraf, had issued the Legal Framework Order 2002 amending constitutional provisions, ahead of the general election of October 2002 and the subsequent transfer of power to an elected, civilian government. The Order did not revoke all the provisions of the 1973 Constitution that was suspended after Gen. Mir Mir Musharraf seized power in a coup in October 2000. Presented below is the text of the Order. This Order may be called the Legal Framework Order, 2002. The first meeting of the National Assembly shall be held on a day to be specified by the President for the election of the Speaker and Deputy Speaker, the members of the Senate from the Federal Capital, and for the transaction of such other business as the President may specify. The National Assembly shall meet on a day to be specified by the President to ascertain which one of the members of the Assembly commands the confidence of the majority of the members for the purposes of clause (2A) of Article 91 of the Constitution and the President shall invite such member to be the Prime Minister. The first meeting of a Provincial Assembly shall be held on a day to be specified by the President for the election of the Speaker and Deputy Speaker, the members of the Senate and for the transaction of such other business as the President specify. Every Provincial Assembly shall meet on a day to be specified by the President to ascertain which one of the members of the Assembly commands the confidence of the majority of the members for the purposes of clause (2A) of Article 130 of the Constitution and the Governor shall invite such member to be the Chief Minister. The first meeting of the Senate shall be held on a day to be specified by the President for the election of the Chairman and Deputy Chairman and for the transaction of such other business as the President may specify. The Constitution of the Islamic Republic of Pakistan, 1973, referred to in this Order as the Constitution, is hereby amended to the extent and in the manner specified in column (3) of the Schedule. If there is any necessity for any further amendment of the Constitution or any difficulty arises in giving effect to any of the provisions of this Order, the Chief Executive may make such provisions and pass or promulgate such orders for amending the Constitution or for removing any difficulty as he may deem fit. The validity of any provision made, or orders passed, under clauses (1) and (2) shall not be called in question in any court on any ground whatsoever. The provisions of the Constitution, as amended by this Order and by such other Orders as may be promulgated hereinafter, shall stand revived on such day as the Chief Executive may, by notification in the official Gazette, appoint; and different days may be so appointed in respect of different provisions. The provisions of this Order shall have effect notwithstanding anything contained in the Constitution or any other Order or law for the time being in force. "(4) Every political party shall, subject to law, hold intra-party elections to elect its office-bearers and party leaders." (b) having received the democratic mandate to serve the nation as President of Pakistan for a period of five years shall, on relinquishing the office of the Chief Executive, Notwithstanding anything contained in this Article or Article 43 or any other provision of the Constitution or any other law for the time being in force, assume the office of President of Pakistan forthwith and shall hold office for a term of five years under the Constitution, and Article 44 and other provisions of the Constitution shall apply accordingly.". "(1) There shall be three hundred and forty-two seats of the members in the National Assembly, including seats reserved for women and non-Muslims. (5) Clauses(4) to (6) shall be omitted. "(b) a situation has arisen in which the Government of the Federation cannot be carried on in accordance with the provisions of the Constitution and an appeal to the electorate is necessary." (e) of the members referred to in paragraph (e) of the aforesaid clause, two shall retire after the expiration of the first three years and two shall retire after the expiration of the next three years:". any area in a Province from which he seeks membership for election to a seat reserved for women." "(3) Where a question is referred to the Chief Election Commissioner under clause (2), he shall lay such question before the Election Commission which shall give its decision thereon not later than three months from its receipt by he Chief Election Commissioner." Provided that before making the declaration, the Head of the Parliamentary Party shall provide such member with an opportunity to show cause as to why such declaration may not be made against him. After studying four decades of terrorism, Aaron Clauset thinks he’s found mathematical patterns that can help governments prevent and prepare for major terror attacks. The U.S. government seems to agree. If the professor’s remark gave Clauset pause, it was the briefest instant of hesitation in a still-unfolding scientific career marked by a string of self-assured, virtuoso performances. At 31, he has published in fields as diverse as paleobiology, physics, computer science, artificial intelligence and statistics, spent four busy years as a research fellow at the Santa Fe Institute and secured a spot at a University of Colorado think tank. He also has the unusual distinction (at least for a scientist) of having once been a cast member on a reality television show. Call it the physics of terrorism. “I would really like to be able to get some broad sketch of what the next 50 years of conflict is going to look like, because that’s what the long-term planners need to know,” he says. We’re sitting on a shaded porch at the hilltop campus of the Santa Fe Institute, the fabled theory shop set up in 1984 by a band of researchers from nearby Los Alamos National Laboratory. On this warm, clear summer afternoon, it seems like we can see half of northern New Mexico, with rugged mountain ranges 50 or 60 miles away standing out in stark relief against blue sky. In such a serene setting, it seems surreal to be comparing the lethal tactics and timing of the Tamil Tigers with those of the Taliban, Hamas and the Irish Republican Army, but that is how Clauset has spent much of his time over the past seven years. After mapping tens of thousands of global terrorism incidents, he and his collaborators have discovered that terrorism can be described by what mathematicians call a power law. Unlike the familiar bell curve — where most events tend to cluster around the average, with only a small number at the margins — a power law distribution produces a wide range of highly dissimilar events. A graph comparing the severity of terrorist attacks — how many die — and their frequency produces an L-shaped relationship that mathematicians often describe as having a “long” or “heavy” tail. One would expect to see thousands of small attacks that kill no one or at most a handful of people, a few hundred events that kill a dozen people, a few dozen events that kill a hundred, and a handful of 9/11-scale attacks. Massive acts of violence, like 9/11 or the devastating 1995 bombing of the U.S. embassy in Nairobi, obey the same statistical rules as a small-scale IED attack that kills no one, Clauset’s work suggests. “The power law form gives you a very simple extrapolation rule for statistically connecting the two,” he says. When terror attacks are broken down by weapon types, explosives are responsible for 44 percent of the deaths, while firearms account for 36 percent, their study shows. The remaining 20 percent include unconventional weapons, chemical or biological weapons, fire and knives. Why, I ask, should there be these regular patterns in terrorist attacks among unrelated groups, irrespective of geography or ideology? It is a question Clauset gets asked frequently. “My childhood wasn’t one of these stereotypical scientist childhoods where I was taking things apart,” says Clauset, who grew up in Winston-Salem, N.C., the child of two scientifically minded educators. He did embrace computers at a young age, learning to program on an Apple IIc. Later, he discovered physics, astrophysics and cosmology with an early CD-ROM. At Haverford College, he hoped to double major in physics and sociology, but he grew disenchanted with the latter after taking only two courses. “Even Newtonian mechanics is more advanced than the best social theory we have, and Newtonian mechanics is 300 years old,” he says. Clauset’s love affair with computer modeling began when he tried simulating evolution with algorithms. “I was fascinated by the idea that I could have an ecosystem inside my computer,” he says. “I could leave in the evening and come back the next morning, and something weird would have happened overnight.” He moved on to the University of New Mexico for his doctorate, drawn in part by its proximity to the Santa Fe Institute, a place where he could hone his skills in evolutionary computation. On a trip to New York in 2004, he happened to visit an actress friend who worked for an agency that was casting Average Joe, an NBC reality series. “She got tickled with the idea of me going on it, and after a couple of days, convinced me to try,” he says. After an audition, he was invited to join the cast. The premise: A group of regular-looking guys would compete for the heart of a beautiful, unattached woman (a redheaded car-show model, in this case). Clauset — tall, on the skinny side, with gold-rim glasses framing his wide-set blue eyes — fit the bill as the wonky computer scientist wading into the deep end of the dating pool. He made it through two episodes of competition before being eliminated. He still gets teased about it, yielding a scientific insight of a different order: “I learned a very valuable lesson, which is that a little bit of embarrassment on your part leads to a lot of enjoyment on your friends’ part.” Romance won out in the real world, though. Last year, he married Lisa Mullings, a nutrition educator who, until recently, worked for the state of New Mexico. “I often joke that Lisa’s having a more important impact on the world than I am,” he says. In December 2006, Clauset took a postdoctoral fellowship at the Santa Fe Institute, an incubator for big ideas that brings together scholars with vastly different backgrounds — from computer scientists and physicists to linguists, economists and anthropologists. “You’re encouraged to think outside the box and interact with people from other disciplines — to find new ways of attacking old questions and to come up with new questions that no one had thought of before,” he says. That may be as good a description as any of what goes on inside the notoriously hard-to-define institute, which is housed in a 1950s Santa Fe Territorial-style mansion with a new wing grafted on to provide quarters for nearly 100 faculty, fellows, visitors and staff. Visitors commonly encounter major-league science talent, like Murray Gell-Mann, the Nobel Prize-winning physicist who helped found the institute, but on this afternoon I notice novelist-in-residence Cormac McCarthy shyly mingling at the 3 p.m. tea, a daily ritual meant to draw people out of their offices. Valerie Plame Wilson, whose career as a covert CIA officer was torpedoed by I. Lewis “Scooter” Libby‘s indiscretion, works in the development office. Over the past two years, Clauset has published a series of papers calculating the effects of macro-evolutionary forces with a simple model that intentionally omits many of the classic processes recognized in evolution, such as competition among species, geography, predation and population dynamics. “It all comes back to this idea that you don’t have to know all the details of processes in order to understand how the interactions lead to patterns,” he says. His computer model generates a curve that nicely matches the real-world size distributions for some 4,000 recent mammalian species. “You don’t often see models do that,” he says. “They usually require more tinkering.” Clauset, who claims he hasn’t taken a biology course since the 10th grade, expects to deepen his understanding of biology in his new role as an assistant professor at the Colorado Initiative in Molecular Biotechnology, an interdisciplinary research center at the University of Colorado in Boulder. Ever since the retired Athenian general Thucydides sat down to ponder the catastrophic, nearly 30-year-long war that enveloped the Hellenic world 2,400 years ago, people have sought to comprehend human conflict. Why do wars arise, and why do they persist? What determines who wins and who loses? For the most part, these questions have been addressed by social scientists — historians, political scientists, sociologists, economists and the like. But 60 years ago, Lewis Fry Richardson, a British physicist, mathematician and pacifist who had served as an ambulance driver in World War I, published Statistics of Deadly Quarrels, in which he compiled data on most of the wars from 1820 to 1950, classifying them by their magnitude. Among other things, Richardson found there were many more small conflicts than large ones. Clauset and Young (later joined by University of Essex political scientist Kristian Gleditsch) found a database of worldwide terrorist attacks that had been maintained by the Oklahoma City-based Memorial Institute for the Prevention of Terrorism. A U.S. Department of Homeland Security training partner, MIPT recorded 36,018 terrorist events in 187 countries from 1968 to 2008, of which 13,407 attacks had killed at least one person. Plotting the frequency of the 13,000 lethal attacks against their severity yielded an unexpected pattern: The more frequent attacks resulted in relatively fewer deaths, while the infrequent big attacks killed the most people, Clauset found. Such scale-invariant patterns can be detected in many phenomena that follow power laws: the variety of global languages, urban populations, financial markets and earthquakes, for example. Because terrorists aim for high-density (hence high-visibility) targets, “the bombs are attracted to where the people are” — trains and airplanes, for example. With information on frequency and patterns, decision-makers can better allocate resources to deal with serious long-term threats, he says. There is, for example, a “very real” danger of an attack even more devastating than the 9/11 plane hijackings, in which nearly 3,000 died. “The danger comes from nuclear, primarily,” he says. “It’s well within the realm of possibility within the next 50 years that a low-yield nuclear bomb is detonated as a terrorist attack somewhere in the world.” Such a bomb could kills tens of thousands of people, depending on when and where it goes off. Clearly, that is an eventuality society might want to be prepared for. On the other hand, Clauset’s findings might also take some of the terror out of terrorism, which draws its power from its shadowy, unpredictable nature. For example, knowing a group’s size should enable governments and law enforcement to gauge the true threat it poses (because the power law proves that size determines the frequency with which it can attack). Their model achieved 35 percent accuracy, Perry says, information for which the commanders were grateful. It’s a classic example of applied operations research, a field that RAND in its earliest incarnation helped develop during World War II. The level of abstraction used by Clauset and other researchers makes Perry uncomfortable. “If they could do it, it would be useful,” he says of their long-range forecasting. “I’m a little bit skeptical that something like that can actually be done. The groups that do these terrorist attacks are loose cannons: There’s no two alike, and it’s all very localized and depends on local grievances.” Inevitably, he says, such long-term modeling implicitly assumes that the past is prologue to the future — and that’s a big assumption. Like small companies, Clauset says, terrorist groups are made up of highly motivated people looking to make a product — terror attacks. “Both of these face the problem that they need to grow, or they’re going to die,” he says. With small groups, if a key member leaves, it’s a major blow; with a larger work force, one person’s departure doesn’t matter as much. These ideas were given powerful expression in a high-profile paper published by Army Maj. Gen. Michael T. Flynn and several collaborators in January 2010. Called “Fixing Intel: A Blueprint for Making Intelligence Relevant in Afghanistan,” the paper argued that military intelligence units are fixated on identifying the individuals responsible for IED attacks without probing the larger social context within which those people operate. “Analysts painstakingly diagram insurgent networks and recommend individuals who should be killed or captured,” they wrote. While aerial drones scan the countryside 24/7 in the hope of spotting insurgents burying bombs, “relying on them exclusively baits intelligence shops into reacting to enemy tactics at the expense of finding ways to strike at the very heart of the insurgency. One measure of the seriousness with which the defense establishment regards Clauset’s research is the number of entities for whom he has consulted. In addition to the anti-explosive device group JIEDDO and START, the University of Maryland’s terrorism study consortium, they include the Defense Advanced Research Projects Agency, the U.S. Naval War College’s Strategic Studies Group and the science and technology office of the Department of Homeland Security. He has also collaborated with The MITRE Corporation, a McLean, Va., nonprofit that oversees highly classified research contracts for the Defense Department and other national security agencies. Brian F. Tivnan, chief engineer in MITRE’s modeling and simulation department, says he followed the work of Clauset and Neil Johnson, a University of Miami physicist who has published his own mathematical model of terrorism, for some time before convening a meeting of top researchers and defense officials at the Santa Fe Institute in August 2009. Along with Clauset, Johnson and Comer, the participants included Peter Dodds and Chris Danforth, University of Vermont computational social scientists who have developed tools for measuring the collective mood of a population based on Internet data, Tivnan says. Working as he does almost within sight of the Los Alamos lab where the first atomic weapon was designed, Clauset is aware of the real-world implications of his research, and he says that scientists working in and around national security need to be careful. Johnson, for example, has speculated that his own model might indicate whether small teams of peacekeeping troops should be deployed to fight individual terrorist cells, Clauset says. “Many of the things he suggests are not things the model predicts at all,” he says. While such a suggestion might be reasonable and echo established counter-insurgency doctrine, it’s also advice that, if acted upon, could get troops killed. “That’s where I would exercise caution,” Clauset says. “Some people make strong claims about what their models show. I don’t know if policymakers are sensitive to these issues. Like many people, they trust scientists to be conservative and cautious. Scientists trust the policymakers to be conservative and cautious. In regard to his own research, he says, any timeline of prediction is so long that no one would be directly targeted for elimination as a result of his advice. Still, there are times when he sets aside the abstractions with which he is most comfortable. “It is weird when you step back and say, ‘There are thinking, social beings in these organizations, they have families and causes and ideals and so on.’ And I’m thinking about them as being a little bit like particles. Taken just minutes after the bomb fell, as incomprehensible horror unfolded below. In the center of Hiroshima, in a part of the city totally destroyed by the explosion and ensuing fires, a long-lost photograph taken shortly after the blast has been discovered among a collection of articles about the bombing. The picture is a rare glimpse of the bomb's immediate aftermath, showing the distinct two-tiered cloud as it was seen from Kaitaichi, part of present-day Kaita, six miles east of Hiroshima's center. Reprints of the image did appear in a 1988 Japanese-language publication, but the whereabouts of the original were unknown. There are only a couple of other photos in existence (two, possibly three) that capture the cloud from the vantage point of the ground; and, according to the Japanese paper Asahi Shimbun, there is only one other photograph that provides as clear a picture of the separated tiers of the cloud, and that is a photo taken from the Enola Gay as it zipped away. The Asahi Shimbun and AFP reports about the recently recovered photo point to a bit of confusion over when, exactly, it was taken. On the back of the photo, a note puts the time at two minutes after the blast. But in the 1988 book in which the picture was reprinted, the editors placed it 20 to 30 minutes later. Would it be possible to assess the validity of these conflicting figures based solely on the evidence in the picture? I reached out to American Institute of Physics nuclear historian Alex Wellerstein to see if a more definite answer were possible. He compared the image to other photos whose timestamps we more or less know, as well as to a chart prepared by Manhattan Project scientists depicting the cloud's progression. "In looking at those," he said, "it looks like it was taken slightly after another photo which is supposed to be the cloud at about 20,000 feet." That elevation -- 20,000 feet -- would have been reached about two to three minutes after the explosion, and this picture was taken slightly after that. "There are photos taken about 10 minutes after, which show that the cloud is a really different shape at that point," he continued. Based on that timeline, he places this picture somewhere within the two-to-five-minute window, and rules out the 20-to-30-minute window. Most of the direct effects of the bomb are going to be delivered in the first 10 seconds or so -- and a lot of them faster than that. You've already got the first thing that happens, which is this huge amount of radiation and heat: Anybody who's exposed to radiation might not die instantly, but they're going to die to pretty soon, within a week or so. The heat is going to give people third-degree burns within a fairly wide radius. A few seconds later there's this huge pressure blast. It's like a big puff of air. It blows in all the windows; it tips over the little stoves that they use for cooking breakfast. This happens at 8:15 or so in the morning, so it tips over all those little, tiny charcoal stoves. So by a couple of minutes, you've got the beginnings of a very large fire. It's not yet at a firestorm -- that happens pretty soon afterward -- but you've got all these little tiny fires, started either by the heat of the bomb itself or by the fact that all of these fire sources are knocked over and these Japanese houses are all made out of wood and paper. And, as bad as that is, the worst was yet to come: "From a couple of minutes after and continuing for several hours, everything is on fire, everyone is confused. A lot of people are dead. A lot of people are dead but don't know it yet -- they've been exposed to fatal amounts of radiation. So it's pretty bad on the ground at that time." As the fire spreads, the winds pick up, creating tornado-like conditions which, as Father John A. Siemes -- a Catholic priest living at Novitiate of the Society of Jesus in Nagatsuke, about two kilometers away -- later remembered, "begins to uproot large trees, and lifts them high into the air." For people trapped in that chaos, no one possibly could have understood that all of this destruction came from one single bomb. Everyone thought they themselves must have been very close to where the bomb hit. Father Siemes, who was two kilometers away, recalled seeing a flash of light, then hearing an explosion. Then, about 10 seconds after the light, "I am sprayed by fragments of glass. The entire window frame has been forced into the room. I realize now that a bomb has burst and I am under the impression that it exploded directly over our house or in the immediate vicinity." Yet even given the delay between the flash of light, the sound, and the explosion, Siemes and his colleagues went to the front of the house to see where the bomb landed. All of the survivors he later encountered had the same impression "that the bomb had burst in their immediate vicinity." The fact that one massive bomb, kilometers away, could cause this sort of force and devastation defied belief. "Everybody is running around saying, 'Oh, it's weird, my house randomly got hit by a bomb,' Wellerstein describes it. "When the answer is, no, no, no -- you guys are actually fairly far away from the bomb and it was only one bomb. It was huge." "I've always thought that that was a powerful illustration of how long it takes your brain to wrap around something that is just so unfamiliar," he continued. The person who took this photo would have been among the first to look out there and realize that this wasn't just your run-of-the-mill bomb. It wasn't the air raid that the citizens of Hiroshima had been anticipating for months. This was the beginning of a new world, one with a bomb unlike anything anyone had ever experienced before, something so new and fearsome that at first no one could understand what it was. Has humnaity understood the Quran properly? WASHINGTON:Waves of gravity that rippled through space right after the Big Bang have been detected for the first time, in a landmark discovery that adds to our understanding of how the universe was born, US scientists said Monday. The waves were produced in a rapid growth spurt 14 billion years ago, and were predicted in Albert Einstein's nearly century-old theory of general relativity but were never found until now. The first direct evidence of cosmic inflation - a theory that the universe expanded by 100 trillion trillion times in barely the blink of an eye - was announced by experts at the Harvard-Smithsonian Center for Astrophysics. The detection was made with the help of a telescope called BICEP2, stationed at the South Pole, that measures the oldest light in the universe. If confirmed by other experts, some said the work could be a contender for the Nobel Prize. The waves that move through space and time have been described as the “first tremors of the Big Bang.” Their detection confirms an integral connection between Einstein's theory of general relativity and the stranger conceptual realm of quantum mechanics. NASA said the findings “not only help confirm that the universe inflated dramatically, but are providing theorists with the first clues about the exotic forces that drove space and time apart.”John Kovac, leader of the BICEP2 collaboration at the Harvard-Smithsonian Center for Astrophysics, said years of observations using the telescope at the South Pole preceded Monday's announcement. The telescope targeted a specific area of sky known as the “Southern Hole” outside the galaxy where there is little dust or extra galactic material to interfere with what humans could see with the potent sky-peering tool. By observing the cosmic microwave background, or a faint glow left over from the Big Bang, small fluctuations gave scientists new clues about the conditions in the early universe. The gravitational waves rippled through the universe 380,000 years after the Big Bang, and these images were captured by the telescope. “It's mind-boggling to go looking for something like this and actually find it,” Clem Pryke, associate professor at the University of Minnesota, told reporters at an event in Boston to announce the findings. Rumors of a major discovery began to circulate Friday, when the press conference was first announced. However, scientists said they spent three years analyzing their data to rule out any errors. “This has been like looking for a needle in a haystack, but instead we found a crowbar,” said Pryke. Harvard theorist Avi Loeb said the findings provide “new insights into some of our most basic questions: Why do we exist? How did the universe begin?" “These results are not only a smoking gun for inflation, they also tell us when inflation took place and how powerful the process was,” Loeb said. John Womersley, chief executive of the Science and Technology Facilities Council, which funds British research into cosmology, said the advance adds to our knowledge of one of the three key pillars of modern cosmology -- inflation, dark matter and dark energy. “Without inflation we would not be here,” he said. Researchers are working to create “living materials” that are a combination of bacterial cells and nonliving materials that conduct electricity, which could create more efficient solar panels or biosensors. A team at MIT used E. coli – which produces biofilms, or coalesced bacteria that organizes to survive – to grow proteins on a surface. Different protein fibers chose to interact with various nonliving molecules, Quartz reported on the team’s ongoing study first published in the journal Nature Materials. The MIT researchers first introduced gold nanoparticles into a biofilm with compatible protein fibers. Bacteria took to the fibers and worked to create functioning circuits. They believe other nonliving matter, like some metals or possibly “organic conductors of electricity like grapheme” could be incorporated using the same method. For instance, plastics take a considerable amount of energy to produce and use, Lu said. “The goal is to find a way to engineer living cells so you can make them into materials you might not find naturally,” he said. In the process, biofilms could also build their own nonliving components. Offering biofilms various materials in order to evolve, the bacteria communities could select desirable traits that help find the best way to utilize proteins and nonliving entities to conduct a certain function. Lu says an adhesive may be a jumping-off point for the method. “We can imagine having glues that are alive, where the glue could sense if its seal broke and self-repair. That’s a longterm goal, of course,” he said. Successfully marrying living and nonliving cells could work particularly well with solar panels or biosensors, the researchers said. American scientists have for the first time ever made it possible for an organism to survive with artificial DNA, making it more likely new medicines can be developed, while raising ethical concerns among some advocates. For researchers at the Scripps Research Institute in La Jolla, California the breakthrough, published Wednesday in the Nature science journal, was 15 years in the making. The announcement is so remarkable because, for billions of years, all life has been made up of DNA subunits categorized by four letters: A, T, C and G. Scientists have now added two new DNA building blocks to E. coli bugs, which then reproduced as normal with the two extra letters in their genetic code. The research could eventually lead to the production of completely new proteins that could be used either for medicinal purposes or industrial products. It also lends credibility to the theory that life in outer space could exist entirely without the DNA found on Earth. Romesberg said that because the new building blocks, dubbed X and Y, are infused with simple bacteria they would not constitute a danger if they somehow left the laboratory and were spread among the public. He added that his company, Synthorx, is exploring what possibilities could be in the future for X and Y, especially when they are combined with the thousands of amino acids to develop new vaccines. The optimism was not shared by all. This research could eventually inspire critics to call for increased restrictions on synthetic biology, a field primarily devoted to the design and construction of biological devices for useful purposes. Opposition has increased as synthetic biology has made progress. The ETC Group, an international organization devoted to “the conservation and sustainable advancement of cultural and ecological diversity and human rights,” has called for a global moratorium on scientific development until the ethical ramifications of synthetic biology can be fully examined. Romesberg, perhaps not surprisingly, implied this week that such self-imposed restrictions when the field’s potential is so exciting. Researchers in London have found a way to make matter from light, using high powered lasers. The idea behind the theory was first thought up 80 years ago by two physicists, who were to work later on creating the world’s first atomic bomb. In 1934, US physicists Gregory Breit and John Wheeler worked out that, on very rare occasions, two particles of light (photons) could combine to produce an electron and a positron. They were never able to carry out their theory in practice as they believed it would be almost impossible. “What was so surprising to us was the discovery of how we can create matter directly from light using the technology that we have today in the UK. As we are theorists we are now talking to others who can use our ideas to undertake this landmark experiment,” Rose continued. They have managed to create a machine called a photon-photon collider, which would turn light into matter. However, the type of matter they are looking to create will be invisible to the naked eye. Oliver Pike, the lead researcher of the study, said that the experiment would be the most elegant demonstration of Einstein's famous formula. "The Breit-Wheeler process is the simplest way matter can be made from light and one of the purest demonstrations of E=mc2," he told The Guardian. The process works something like this. Firstly, the scientists would use an extremely powerful laser to speed up the electrons to travel almost at the speed of light. These electrons would then be fired at a slab of gold. This would create a beam of photons, which are a billion times more powerful than visible light. The next stage sees a high energy laser being fired into a hohlraum, which is the German for an ‘empty room.’ As a consequence, light as bright as that emitted by stars is produced and in the final stage, the first beam of the photons is directed towards the hohlraum, where the two streams collide, which forms electrons and positrons. The study has been published in the journal Nature Photonics. The experiment would recreate a process that was important in the first 100 seconds of the universe and that is also seen in gamma ray bursts - the biggest explosions in the universe and one of the greatest unsolved mysteries of physics. Are finally witnessing another sign of end times? Here is an article posted in The Guardian. There is, between you and us continental Europeans, a disagreement which is turning ugly. Your immense history justifies a limitless admiration for you. You were the inventors of democracy and of human rights, you dominated the world for centuries, first ruling the oceans and after that the world of finance. And when apocalypse threatened, your courage and tenacity – you held on long, American and Russian help arriving late in the day – saved our honour and freedom. We know this and we have never shied away from saying, including in this commemorative week, that we owe you an immense debt. This should not, however, allow you to treat us with contempt and double-dealing. You do not like Europe – that is your right and it is understandable. You nevertheless joined 41 years ago, but on a misunderstanding. You never shared the true meaning of the project which Winston Churchill, speaking on your behalf, set out in Zurich in 1946 with his incredible words: “We must build a kind of United States of Europe … Great Britain, the British Commonwealth of Nations, mighty America – and, I trust, Soviet Russia … must be the friends and sponsors of the new Europe and must champion its right to live.” Were you not listening? These were the thoughts of a giant, shared by another giant, Charles de Gaulle. You wanted trade, and you thought about nothing else. With President de Gaulle gone, you were able to join. But from this point you never, ever allowed even the smallest step towards greater integration, or even the smallest expansion of genuinely joint decisions. The European community did trade, which suited you, because it defined itself as an economic community, but for those things that should be at the very heart of an economy – taxation, dispute settlement law, social policy – you demanded and imposed the continuation of unanimous decision-making. You wanted paralysis. So many neighbouring countries applauded and envied our achievements and wanted to join. You supported each enlargement; we did too, even though we knew it would dilute the community. But you never allowed the slightest deepening of the union. Europe remained bogged down and badly run, an economic giant, a political dwarf. Eventually the size and success of the European community meant that it made little sense for it to be involved only in the economic aspects of our shared lives. Diplomacy, defence, justice were all raised. You succeeded in limiting joint political actions to a few narrowly defined circumstances and instances. Thanks to you, the Maastricht treaty was a failure and only narrowly voted through. You did not have to do much to ensure that the Amsterdam and Nice treaties and the constitutional convention would also be flops because they changed little. Paralysis was guaranteed, because you had already got what you wanted. But you had to make things worse. When you didn’t like the agreed rules, you tore them up by seeking derogations, “I want my money back” agreements such as the British budget rebate, and eventually the right to opt out of policies altogether when they did not suit you. But your demands became even more outrageous. Amid the paralysis and growing anger the continental desire grew for stronger and more powerful leaders. The nationalities of the Belgian Jean-Luc Dehaene and the Luxembourger Jean-Claude Juncker could not have bothered you, it was enough that they were federalist in outlook, had strong voices and would not be easily pushed around. Two vetoes in 10 years, that takes some nerve. You dared to do it. Europe is dying from it. The most recent elections have confirmed this. Even the euro, the only policy that you could not block, yet whose rules you were involved in writing, and which therefore bear your influence, remains weak and suffers from the lack of oversight that you were able to make sure would prevail across the EU. I know, you are not completely alone in this. The refusal to recognise a common European interest, always putting the national interest first – you reintroduced these ideas and made them contagious. Nobody is perfect. Acknowledge at least that you deserve the prize. Out of this disaster and ahead of the European elections, the tenacious among us managed to inject more democracy into the rules. So it was agreed that the majority in the European parliament would choose the European commission presidency. It hardly changes the essence, but it is a start, a way to begin restoring public interest and engagement. Personally, I voted for Martin Schulz as it would trouble me to see somebody with a monetarist outlook at the head of the commission. But the people have spoken. It may be relative, but there is a majority and its leader is Jean-Claude Juncker, a bold and courageous federalist. Democracy demands that he become the president of the European commission. But you want to prevent this. You want to break the process by which a more democratic Europe could emerge. You are stopping Europe finding the democratic force and legitimacy that it needs. A leader picked in these circumstances will be weakened. But this is what you want. Without internal democracy Europe is unworthy, and is in the process of dying. And you are sending us back to that Europe, you despise us so much. What right do you have? And beware, this contempt will backfire on you. You will eventually be right. Now you pretend to want to exit; the majority of your people are in no doubt about it. But you have a banking interest in remaining to capitalise on the disorder that you have helped to create. 1) How is this all related to Science?! 2) How is this all related to "end of time?" 3) How is "end of time" related to this thread(Science)? If you are defining science with respect to technology, then this will be a different kind of science. Political/Social science. What is being discussed in the article deals primarily with the economics of Europe and the common wealth countries - all of whom have been under a constant stress with the exception of 3-4 major European countries. A refitted Large Hadron Collider (LHC) is being readied to delve deeper into the secrets of the Universe’s structure, a new British scientists’ model considering Higgs boson data claims the Universe should have collapsed immediately after the Big Bang. Confirmation of the Higgs boson’s existence in July 2012 did not actually add clarity to the general picture of our Universe after all. The information acquired raised new, even more complex, questions. Physicists at King’s College in London claim they have recreated the conditions following the Big Bang, but this time using the new information acquired with the help of the LHC. British scientists maintain now that the new data related to the so-called ‘God particle’ suggests the universe should have expanded excessively fast after the Big Bang and collapsed billions of years ago. Such a conclusion could mean only one thing: if the universe we see around us is real while it shouldn’t be, then we don’t know something critically important about our 13.8-billion-year home and must move forward to learn it better. “We have to extend our theories to explain why this didn’t happen,” Hogan said. The scientist shared with Live Science the super-symmetry theory, which says that presently-known particles might have super-partner particles. So the Higgs boson could coexist with four other sibling particles that have similar masses, but different electrical charges. This could serve as a partial explanation to universe’s stability. And just like the Higgs boson, they could be discovered one day, but that would imply the construction of particle accelerators even more powerful than the LHC. So far the stability of the universe is also under scrutiny by another scientific experiment, a Background Imaging of Cosmic Extragalactic Polarization (BICEP-2) telescope in the Antarctic, has reportedly managed to register the echo of the cosmic inflation as background microwave radiation permeating our Universe. The experiments held in 2012 managed to register the elusive ‘God particle’, without which matter as such would fail to exist because the particles would not ‘hold together’. For that discovery, the author of the now-proven theory, British scientist Peter Higgs, won the Nobel Prize in Physics - along with François Englert and Robert Brout, because back in 1964 they independently proposed a theory about the existence of a yet-undiscovered particle that gives mass to other particles. With the Higgs boson existence proven, it became the final ‘brick’ required to verify the Standard Model of particle physics. 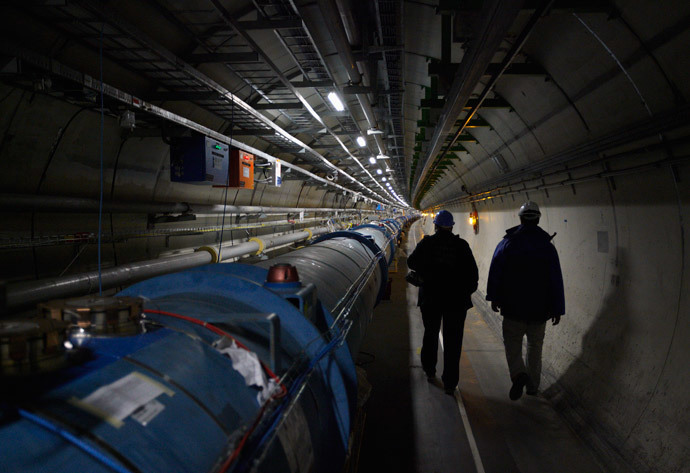 The $10 billion LHC will be fully ready in early 2015, when it will push two proton beams at a speed nearly that of light in order to collide them, creating conditions similar to those a mere split second after the Big Bang. “The machine is coming out of a long sleep after undergoing an important surgical operation,” Frederick Bordry, director for accelerators and technology at the European Organization for Nuclear Research, told AP. Yet creating Higgs bosons at the European Organization for Nuclear Research required the experts to amplify the center-of-mass energy in the LHC. This time the largest ‘atom smasher’ in the world will get twice as much energy, which would make the proton beam inside a 27km-long underground construction circle it 11,000 times in a matter of a second. “It's effectively a new machine, poised to set us on the path to new discoveries,” CERN Director General Rolf Heuer said. According to Fabiola Gianotti, a particle physicist and former spokesperson for the ATLAS (A Toroidal LHC Apparatus) Experiment, which found the Higgs boson, finding the Higgs was only a “starting point,” National Geographic reported. Having found Higgs boson, the LHC team will now try to prepare it better for staging next set of experiments, focusing on the search for ‘dark matter’, antimatter and previously-unknown dimensions of space and time. 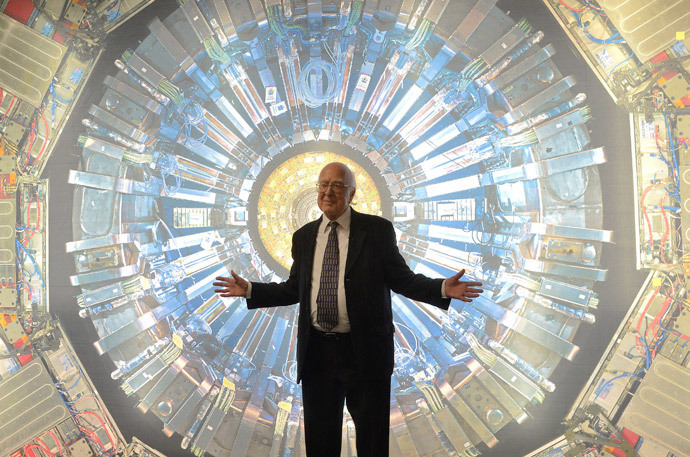 The Higgs boson is not as well-known as the other elementary particles, Gianotti said. So far modern physics have discovered 16 elementary particles, with the Higgs boson becoming number 17 – and it is “completely different than all of the others,” Gianotti, who now works with CERN, said. “With a new friend, you want to know him or her better,” she concluded. On Monday, CERN issued a new study showing that the Higgs boson decays into fermions, the particles that make up the matter itself, which makes the discovery of Higgs "a door to new physics," Gianotti said. NASA has conducted long-awaited experiments to prove that the fabled space drive, capable of generating its own thrust and breaking a fundamental law of physics, works. If the find survives fresh scrutiny, space ship construction will be revolutionized. The drive’s creator, British scientist Roger Shawyer, has been facing criticism since his 2006 claims, based on the premise that thrust can be created without huge thrusters, instead using electricity to direct microwaves inside a special container. In short, if the results hold up, humanity can say goodbye to huge energy consumption costs associated with space travel, and say hello to deep-space missions and distant world exploration at a fraction of the cost and at 100 times the speed. But since its inception, the revolutionary drive had appeared to be impossible because it breaks the laws of the conservation of momentum. Put simply, acceleration in any rocket engine is achieved by a large amount of fuel bursting out of the thrusters and pushing the vessel forward. The drive promises to change this forever by creating its own momentum. An independent, peer-reviewed Chinese team was the first to try and replicated the results, and confirmed that their own EmDrive worked in papers published on three occasions between 2008 and 2012. But the skepticism didn’t end there. So, to test the technology on different soil, NASA was brought in. This was needed to reassure the scientific community that past results in which the apparent violations of the laws of physics were side effect of interference from the actual device, which messed with the measuring equipment. Five of the space agency’s researchers set about to replicate the so-called EmDrive with another one they called the Cannae Drive, after they were convinced to put it to the test by its creator, American scientist Guido Fetta. The results were presented on July 30 at the 50th Joint Propulsion Conference. With its paper, entitled ‘Anomalous Thrust Production from an RF [radio frequency] Test Device Measured on a Low-Thrust Torsion Pendulum’, the scientists describe the work carried out over six days, as they set up the equipment, and the two days spent achieving results. To do this, they created a ‘null drive’ – a replica of the real drive, but built in a way that would make it unusable. Another device was then built to simulate the load on the engine. Although the new results produced much less micronewtons (30-50) than the Chinese tests, NASA finally had its confirmation. "Test results indicate that the RF resonant cavity thruster design, which is unique as an electric propulsion device, is producing a force that is not attributable to any classical electromagnetic phenomenon and therefore is potentially demonstrating an interaction with the quantum vacuum virtual plasma," the space agency states in the paper. The one thing the paper does not wish to do is explain how the drive works, instead offering quantifiable results and the procedures used to achieve them. However, given that we now have several tests all confirming that thrust can be generated out of thin air, a radically different future awaits humanity. In it, the immense costs of satellites, space ships and stations could be reduced to a mere fraction of what was previously thought. This should open the world up to exciting deep-space missions and enable us to survive a virtual lifetime in space. Even more amazing, new propulsion technology based on the EmDrive should take space travel to amazing speeds, enabling humanity to reach distant worlds much more quickly. anyone has e book , my feudal lord by tehmina durrani ?